Christ follower; Software Engineer; CS@VT Alumni; A/V Technician; Video Producer; Reader; Writer; Adventurer. Sunday was our last day in Alaska, and we decided to make the most of it. Sunday morning we got up early, packed up at our Airbnb, and met Joe and Sarah for church at Faith Christian Community. They were celebrating baptism that morning, and it was cool to participate with other believers in that. I also hunted down the sound guy after service to ask a few questions (as is custom). After church, we swung back by REI to drop off our skis (great deal, by the way - $19 cross country ski rental for three days with REI membership) and then went to Play It Again Sports to rent ice skates for our last adventure! From the research I did, Westchester Lagoon seemed to be the most popular outdoor ice skating area for families in Anchorage. Maintained by the Municipality of Anchorage, it consists of a large cleared oval almost a quarter of a mile long. You could really get up to speed on the straight stretches, as opposed to an indoor rink - which was a ton of fun. Speaking of getting up to speed. I knew we would all have various levels of experience, but Adam really surprised me. Before we went out, he told us he had been on ice skates one other time in his life, when he was a kid. However, he neglected to mention the years of inline skating and roller hockey experience that obviously translated beautifully to the ice. The rest of us were in various states of wobbling around while Adam was literally skating circles around us - backwards. Now, if it weren't for this final outing, I would be able to say I brought everyone home who went with me alive and uninjured. Alive, yes. Uninjured, not quite. Jocelyn took a pretty hard fall to the kneecaps near the end of our time on the lagoon. Adam and I were coming up behind her, saw her fall, and slowed down quickly. I admit my first instinct was to reach for my camera, but it looked like she might actually be hurt. When we got to her, she was laughing, but it was obvious her knees hurt pretty bad. They had some pretty healthy bruises, but she was a trooper on the way home. After ice skating, it was time to part ways. Seth, Jocelyn, and my flights all left mid-afternoon from Anchorage, while Tanner, Katy, and Adam didn't fly out until 11:30 PM that evening. They dropped us off at the airport, and we all said goodbye. It was strange how significant this goodbye felt, despite knowing how soon we would see each other in Blacksburg. There's just something about spending a week in close quarters together that strengthens the bond between friends. The next hurdle to get over was the massive snowstorm that was starting to slam Seattle, where our connections were. According to Seth's pilot, "Snowmageddon part #3" was beginning, and our friend Michael, who lives in Portland, warned us that the worst storm of the last 20 - 30 years was supposed to hit that night. We three convened again in Seattle once we had made our snowy landings and had dinner at Qdoba. As it turned out, we were able to take off again with only minor delays to deice the wings. Meanwhile, in Anchorage, Tanner, Katy, and Adam visited the Flat Top Mountain overlook and spent part of the evening helping Joe and Sarah move into their new house, utilizing the rental vehicle as a moving truck. The remainder of our trip home was mostly uneventful, with the exception of the breakfast bagel incident in Atlanta. Taking into account the fancy bagel with fixings I received, some poor guy was going to be pretty disappointed with my ham and Swiss on a plain bagel that he was stuck with. This trial aside, team APART was back in Christiansburg before noon on Monday, as was JUST ME soon after. Team KAT had a little more excitement on their way home. Despite seeing their bags sitting on the tarmac, they somehow didn't actually make it onto the plane in Denver. When they arrived in Greensboro they waited at baggage claim for a while before realizing their bags hadn't made it. They were, however, helpfully delivered to Tanner's house at 2:30 AM the next morning. This morning, we woke up to a plane landing in our front yard! Apparently quite a few of the houses surrounding have planes in their garages or basements. Most of them look pretty expensive, and there was an extremely nice dinner party going on in the house down the road this evening. We thought about dropping in and seeing if anyone wanted to join us for breakfast for dinner. We swung by REI to pick up cross country skis and just happened to run into our friends Joe and Sarah again! They offered to go with us over to Kincaid Park and give us some pointers, even though they had just finished an outing of their own. We gladly accepted and met them at the park. We had varied experience among our group - Jocelyn had cross country skied before, Tanner and Seth downhill ski, Katy had been once a long time ago, and Adam and I had never even stood on skis. Needless to say, it took some getting used to. There were several wipeouts along the way, but, pretty soon, we were all fairly comfortable and moving right along. We left Kincaid intending to visit the Alaska Wildlife Conservation Center, but detoured to Popeyes for lunch before leaving Anchorage. Unfortunately, due to delays at Popeyes, it was soon obvious we weren't going to make the cutoff time for entering the park, but we decided to drive down to Whittier anyway, hoping to see the Portage glacier. There were many beautiful spots on the highway down the coast to Whittier, and we stopped at a few roadside pullouts to take in the views and get a few stunning pictures. When we arrived at the entrance to the railroad tunnel to Whittier, Tanner pulled up to the toll both and told the man taking our toll almost immediately, "Bro, you look just like Blake Shelton!" They chatted as the transaction was processed (discussing his mullet, among other things), and we asked him about the hike to the glacier. We then pulled up to the tunnel entrance - only to discover that the next passage wasn't allowed until almost an hour later! Tanner said, "Man, we're going to have to go have a chat with Mr. Blake, again." Thankfully, "Mr. Blake" was kind enough to refund the cost of our toll, realizing, I think, after the fact, that he had allowed us to pay a toll for a time that didn't make sense, given the current time and our stated goal. Since it would have been dark by the time we waited to go through the tunnel, instead, we explored the area around Portage Lake, near the Begich Boggs Visitor Center. Despite not being able to see the glacier itself (which was hidden at the far corner of the lake), the ravine containing the lake itself was majestic. We invited Joe and Sarah to join us for dinner at our Airbnb, and they offered to bring over some reindeer sausage. We gladly accepted, as that went well with the pancakes, bacon, and hash browns we were planning to make for dinner. Last night, Katy had heard a few weird noises in her bedroom (affectionately referring to them as "the attic man") and when she started to hear them again this evening, asked Adam and I to investigate. After a little bit of searching, we discovered a staircase behind her closet that led to the basement hanger, where the owner's plane is parked. The basement itself was in disarray, and the one lone lamp burning in the middle of the garage, along with the pile of clothes laying clumped at the bottom of the steps didn't do much to add to the cheerful atmosphere. We did manage to pinpoint the noises (to the best of our ability) to the heat pump and hot water heater, though, perhaps making Katy feel marginally better about the situation. This morning, we left our Airbnb in North Pole, Alaska to make the journey back to Anchorage. We made several stops along the way to take pictures at a few of the many overlooks scattered down the George Parks Highway, arriving at the Denali National Park winter visitor center around 1:00 PM. After we ate lunch in the adjoining indoor picnic area, we checked out ice grippers for our boots and headed down the Horseshoe Lake trail, which had been suggested to us by one of the rangers. There were beautiful views all around us of the lake, surrounding forest, and adjoining river. This hike gave us another candidate for "Times We Almost Died in Alaska." On the way out, I was hiking in the back as the sweeper, as is custom, right behind Adam. Suddenly, he bent over to pick something up. Our rental car key. I looked ahead of us, and Tanner had taken off his jacket (which the key was in the pocket of) to wrap around his waist as he was warming up. Adam grinned, put a finger to his lips, and we continued hiking. When we got back to the car, Tanner began patting his pockets for the key. Adam took it a step further and set off the alarm. We let the panic build for a minute or two before revealing we had picked up the key a mile or so back. Had we missed the keys, that could have been bad. On the way back to Anchorage, we stopped at the Palmer Municipal Airport to visit my friend Dillon, who works as an airplane mechanic for Ultima Thule Outfitters. Once we found his hanger (an adventure in and of itself) we made and ate dinner with him (soup and grilled cheese), and he told us a little bit about his job. After dinner, he showed us the planes and described how they're used and the maintenance they have to perform on them. I really enjoyed the opportunity to reconnect with him and share some fellowship with him and my other friends on the trip. We finally arrived at our Airbnb for the next two evenings around midnight. This particular house is set on a private airstrip, and is surrounded by houses that can really best be described as mansions. I particularly approve of the large front windows facing the airstrip here. Right off the bat I'll say today is going to be hard to beat. Fewer near death experiences, but more awe-inspiring ones. In fact, I think if we came to Alaska only to enjoy today, it would have been worth it. First things first, remember the rumble we discovered with our rental car? We tried to resolve it with the Avis location in Fairbanks this morning, but, unfortunately, they were fresh out of SUVs. We decided, instead, to see if we could solve this problem on our own. Seth had noticed some snow/mud/rock accumulation on the inside of the rear tires, and wondered if that could be the cause of the rumbling. He found a screwdriver and started chipping away at it - soon involving Tanner, Adam, and Jocelyn to move the vehicle forward in small increments and spray hot water onto the deposits to thaw them out a little and make them easier to chip away. Katy and I got frequent status updates and samples. Sure enough, when we left the cabin, we discovered this had indeed fixed the issue! Perhaps some of the pioneering, self-sufficient Alaskan attitude is rubbing off on us. Our first stop of the day was the Morris Thompson Cultural & Visitors Center. They had some cool displays depicting life in interior Alaska. We also got helpful information and recommendations from a couple of National Park Service rangers and a school teacher volunteering his time. In particular, one of the rangers confirmed that the local lakes would have at least 12 inches of ice on them - meaning a two ton vehicle could be driven out onto the ice without issue. Based on the recommendations we received, we headed out to Tanana Lakes Recreation Area to do some hiking on and around the lakes. When we arrived, we made an unexpected and amazing discovery. An ice skating path (think of it like a massive rink with no center ice) had been cleared on the surface of the lake. As we walked out onto it, we could see just how thick the ice really was - likely between 24 - 36 inches of solid, crystal clear ice. We could see bubbles and tendrils of ice frozen solid deep below us. We skated our way around the loop in our snow boots, periodically encountering the lone local man who was also there, skating laps with his two dogs. Next, we stopped at Pioneer Park, which was fairly deserted at this time of the year. During the summer tourist season, it seemed like it could be the Busch Gardens of interior Alaska - with a model of the historic town of Fairbanks, several associated museums (all closed for the season), and an art and performance venue in the center. Again, with the exception of a few locals, we had the place to ourselves, and particularly enjoyed the kids playground. After wrapping up our visit to the park, we headed out towards Chena Hot Springs for a dip in the natural thermal pools - hoping to see the Northern Lights from there. After a brief altercation with a couple of lockers (they outsmarted Adam and I and took our quarters) we jumped in the pool. With a water temperature of 106°F and an air temperature of about 15°F, it reminded me a lot Iceland. However (as has been our experience with a lot of things in Alaska), this pool was less crowded, and maybe even a little bigger. It also had a nice fountain in the middle (the drops from which would cool you off quickly), but this fountain also produced quite a bit of steam. The steam, combined with the lights around the pool, made for a less than ideal aurora viewing location. 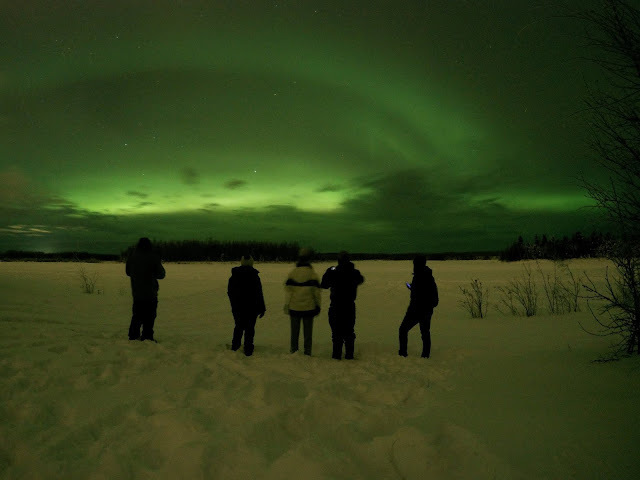 We kept our eyes peeled on the drive home, as one of the interpreters at the visitors center that morning had told us the drive to Chena and back would be a great place to see the lights. We didn't see anything of note, so after we arrived back at the cabin, we had dinner and prepared for bed. Just as everyone was getting ready to crash, Seth checked the NOAA space weather prediction one last time and saw an increased chance of solar activity. I rechecked the UAF aurora forecast and saw that their predictions had become more favorable since I last checked. With some prompting from Jocelyn, we decided to return to the Chena Lake Recreation Area for a last ditch effort to catch the lights before we left Fairbanks. I sure am glad we did! When we arrived, it looked pretty unpromising, and, I admit, I thought the cloud cover was going to ruin our chances once again. However, as our eyes began to adjust to the darkness, we saw a thin band of what looked like lighter colored clouds near the horizon. As we debated whether that could be it, I set up a GoPro to do long exposure (30 seconds). Just as it finished taking the photo, someone asked, "What would you have to see to make you think it is the Northern Lights?" I looked down at my phone and said, "Exactly this. Guys, it's green!" From there, the lights continued to spread across the sky and increase in strength for the next half hour or so. Eventually, they settled back down, and, although they hadn't gone completely away, we decided to call it a night to avoid losing any toes. There were definitely some euphoric moments while we watched, as well as on the drive home, as this was the culmination of a multi-year mission and two trips spent chasing this beautiful part of God's creation. We left Anchorage early yesterday morning and quickly discovered we had a small rumble in the rear of our SUV. Felt like one of the tires was out of balance. We stopped at the Walmart in Eagle River to grab lunch supplies and bear spray and checked in with Avis to see what they could do for us. Unfortunately, their best option was to send a guy with four new tires to replace the ones we had. Not knowing how long that process would take and wanting to get on the road, we declined. Our destination for the day was the town of Fairbanks, with several stops planned to break up the monotony of driving 7+ hours in the snow. We did our best to do most of our driving during daylight hours, as our friend Joe had warned us that the road to Denali is also known as "the bloody corridor" because of the number of moose involved crashes. We did see quite a few moose, including one standing stupidly in the left hand lane. Joe had warned us about this. "Moose are stupid. They're hard to see at night because their eyes don't reflect and they'll just stand in the middle of the road. You'll be going along at 65 MPH and all of the sudden you're staring one in the shins." Our first stop of the day was the small town of Talkeetna - where Seth's parents had told us we might be able to get a view of Denali, if we were lucky. We pulled into town, and, after exploring a few dead ends, found our way to a riverside park. We were amazed to find we had an incredible view of Denali and the associated smaller mountains, with only a few clouds obstructing the view. The river was also frozen solid, so we could walk (or run) out on it. We stopped visited Nagley's general store and picked up a couple of pastries at the Talkeetna Roadhouse before continuing north. Our next destination was Denali State Park, located below Denali National Park. We made this our lunch stop (delicious peanut butter and jelly) before hiking down to Byer's Lake - also frozen solid. This vista was amazing - and almost completely silent. We were literally the only ones there, and except for the occasional passing car out on the main road, the snow absorbed all of the environmental noise. We ran out to the middle of the lake, and, because this America, we still had LTE coverage, so Seth Facetimed his mom. When we arrived in Fairbanks, we raided our second Walmart of the day to purchase dinner supplies for the next two evenings. We split up responsibilities - Adam, Katy, and I were in charge of tacos, and Seth, Tanner, and Jocelyn were in charge of spaghetti for tomorrow night. We arrived at our cabin in North Pole, Alaska around 8:00 PM. A few of our group were confused about the Christmas decorations still up, before realizing - of course, Santa lives at the North Pole year round! Our final outing was to the Chena Lake Recreation Area, hoping to see the Northern Lights! We stood watching for about an hour at different spots, but, unfortunately, we think the cloud cover and low solar activity prevented any spottings. We have another chance tomorrow night, though! That being said, we did get some cool long exposure pictures. Now, for a corner of the blog moms in the audience might prefer to skip. We'll call this "Times We Almost Died in Alaska." As we were traveling north from the state park to Fairbanks, I informed Tanner that he had made up two minutes on the GPS's estimated arrival time. He fist pumped, looked over at Adam, then back to the road just as we started to spin out. He recovered it expertly, but after that, I told him he wasn't getting any more stats until we arrived. As we were leaving the recreation area, Seth was trying to help Tanner navigate. Before we got a good GPS lock, we took a turn down towards the lake. We all realized about the same time - we were about to drive onto the lake! Tanner quickly stopped as we all yelled, and we very slowly backed our way out. Granted, we did see a Jeep driven out to one of the many ice fishing shacks also on the lake, but it wasn't something we wanted to risk with the rental vehicle. When we arrived home (well after midnight), I went to unlock the digital lock on the front door - and found we had also accidentally locked the handle (which we didn't have a key to) on the way out. Out of all the moments that day, this was the one that made me think, "Oh, crap." Luckily, we had opened and forgotten to lock the back door, so we were able to get in. That could have been bad. Today's trip began almost as soon as yesterday ended... quite literally. We all left Blacksburg at crazy early hours in order to catch our flights... out of Roanoke, Greensboro, and Bristol. Team "Always Purchase Airfare Right on Time" (APART) went out of ROA, team KAT (Katy, Adam, Tanner) flew out of GSO, and team JUST ME (Seth) left from TRI. We thought we might be able to coordinate an intercept with Seth in the Seattle airport, before we boarded our separate flights to Anchorage. All was going well until he realized he had misplaced his boarding pass. Apparently, team KAT had had a fun time on their layover as well - almost missing their connection because of a Chick-fil-A sandwich (I mean, there are worse reasons). Needless to say, I was quite relieved to finally have everyone on the ground in Anchorage around 4:30 PM AKST. Next, we picked up our rental car. Avis initially tried to give us a Prius, but we were eventually matched with a Ford Expedition with 4WD. This is our ride for the week! This evening, Joe and Sarah Cline (former members of Northstar Church that several of us knew) invited us over to their home for dinner. They served us a delicious meal of baked salmon, moose stew, potatoes, and other assorted deliciousness. It was good visiting with them, catching up, and having some fellowship with other believers on our first night in Alaska. Tanner, Adam, and Jocelyn even ran out to get ice cream at some point and spotted two moose standing in someone's front yard on their way back! Dinner with Joe and Sarah! This evening, we've crashed at the Comfort Inn in Anchorage, taking advantage of the included breakfast and planning an early departure for Fairbanks in the morning. Once we all got checked in we crammed into the elevator and discovered it wouldn't actually take us to the third floor - at least, not with all of us in it! When ThinkerCon was announced, it took me all of fifteen minutes to decide that I was going to Huntsville, Alabama in November! I immediately purchased a ticket for the event at the US Space and Rocket Center and texted my buddy Jeff, who, oddly enough, was just getting ready to purchase airfare to fly home for Thanksgiving. It didn't take much convincing for him to decide to reroute through Chattanooga so that I could pick him up on my way there! Later on, we added our friends Ian and John to complete our travel group. So, what is ThinkerCon? My quick explanation to people who asked was, "an educational YouTube conference." I've followed and supported a few of the educational content creators that were a part of the conference for several years, but, in particular, I really enjoy Destin from Smarter Every Day, who was organizing the conference. If you've spent any time with me, you've probably seen me sporting a SED shirt at some point. I also appreciate Matt Whitman's Ten Minute Bible Hour, and the No Dumb Questions podcast he hosts with Destin. Additionally, I can be counted among the many Tims who are dedicated listeners to Hello Internet and fans of videos by CGP Grey and Brady Haran. Ian, John, and I departed Blacksburg early Saturday morning and picked Jeff up around midday at the Chattanooga Metropolitan Airport. From there we continued to Alabama, dipping into Georgia a few times in the process. Having never visited Alabama, I was surprised to find how flat it was. I'm used to the Appalachian Mountains, but they seemed to abruptly end just as we crossed the state line. Since we arrived with some time to spare in Huntsville, we decided to squeeze in a hike before heading to the conference. Jeff's sister had recommended Monte Sano State Park, so we hit the trails for a nice brisk hike to stretch our legs. We arrived at the Space and Rocket Center, where the conference was being held, about an hour early and found our way to the back of the line - which already stretched the length of the Saturn V Hall! At this point I realized we were definitely the official delegation from Virginia Tech. All four of us are Virginia Tech engineering alumni (three computer science and one aerospace) and both Ian and I happened to be wearing Virginia Tech sweatshirts. As we walked to the back of the line, some dude wearing a UNC (or NC State, I can never keep them apart) shirt shouted "Go Heels!" (had we lost to North Carolina in a sportsball game recently?). Security had their work cut out for them, screening a thousand people, and we made it all the way to the front of the line just as they had to stop it to give priority to people seeing the 6:00 PM showing of Festival of the Spoken Nerd. I heard very little grumbling about this, and as far as we were concerned, we were happy to be there and enjoyed a conversation with a couple behind us from Tennessee. The first order of business was dinner underneath the Saturn V rocket hanging in the Hall. This was an authentic German meal served by the onsite restaurant, Biergarten, and contained quite the assortment of potatoes. I think I could survive in Germany - those pretzel rolls were delicious! After dinner, we sat in on a live coding competition, then moved to the other end of the hall for several panel sessions. The first was "It's Not Rocket Science (Actual Rocket Scientists)" hosted by Brady Haran. John particularly enjoyed this one as they discussed stress testing rocket engines - which is similar to the job he does every day. We also sat in on "Live Dangerously. The Joy of Play" and a panel entitled simply, "Go Outside!" As the members of the last panel were being introduced, we made an exciting discovery! We weren't the only attendees from Virginia Tech! Derek Hennen introduced himself as a millipede biologist from Virginia Tech and got a whoop from our section. He does research on millipede populations up and down the east coast and runs a Twitter account called DearMillipede. Apparently, Virginia Tech has the only millipede lab in North America. Who knew (not us)! We caught up with Derek after the panel and talked about his favorite places to hike and find millipedes in Blacksburg. Soon after that, it was off to The Festival of the Spoken Nerd show - a (as you may have guessed) fairly brainy science-based comedy show. We were probably one of the few crowds in the world you could tell a combinatorics joke to and people would actually laugh (and wouldn't just be humoring you). Our show finished up just before the fireworks display scheduled to finish off the night. We made our way outside where speakers (along with quite a few car sound systems) were broadcasting the local NPR station. Destin had arranged with them to air the show as he and several other creators discussed the chemistry behind firework colors and combustion so that anyone in Huntsville in view of the Rocket Center could enjoy it as well. It was a great way to end the night! The next morning, Jeff, Ian, John, and I went to the Madison campus of First Bible Church. We were welcomed warmly and told that they had gotten the heads up that they might have some extra visitors that Sunday. As we were talking to a few people before the service we met two other ThinkerCon attendees, including, believe it or not, a Virginia Tech grad student! After the service, we all decided to go to lunch together, and crashed Big Bob Gibson BBQ in Decatur. Must be a popular place, as we noticed several of the ThinkerCon creators at the next table over. On the way home, our crew dropped in to visit our friend Andrew at the University of Tennessee and heard about his ministry at the UTK BCM. He also introduced us to Victor's Taco Shop just down the street. We made it back to Blacksburg well after midnight, but our experience was well worth the many hours in the car. Last but not least, the week after the conference, I found this recap video from Ben Schmanke and realized our group made a cameo appearance around the two minute mark (bottom right corner)!